...have 14,000 miles on it so far. Still on first set of tires! 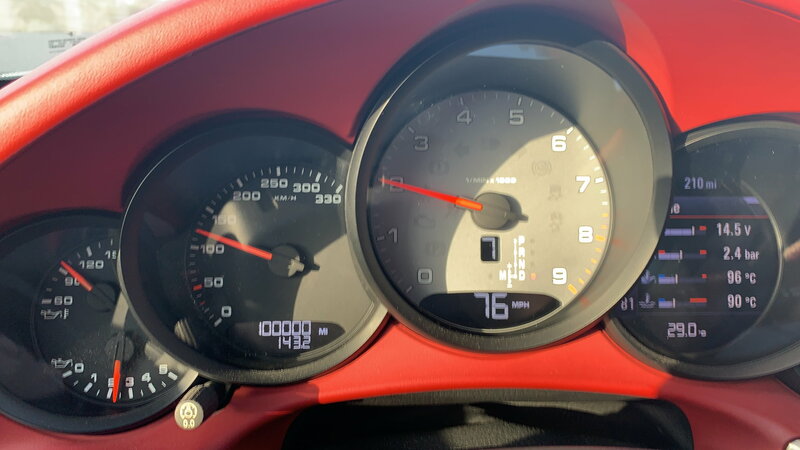 991.2 took delivery on 09/12/2016, now, with 2446km. This is my pleasure use vehicle ;-) Looking forward to adding a lot more enjoyable milage next spring. My daily drive X5 has 41000km after 13 months. I've been racking up the miles on my car. It's a 2014 that I custom ordered and I have 6,000 miles! That's a lot more than my 07 Cayman S with around 5,000. Funny. No auto-x yet for one thing. Drive pretty smooth, normally have my 5 year old with me--so safety & finess outweigh hooliginism. For now. 12.5 C2S just hit 6k. Santa brought it last Christmas with 1200 miles. I'll do ~6k miles a year but it's not my daily driver. My 2015 C2S is at 19,500 after 23 months. I am still on my original Pirelli P-Zero 20" tires with visible tread left above the wear bars side to side. I suspect my PDCC may be contributing to the long and even side to side wear. New to the forum but was wondering about high mileage 991s and came across this thread from a search. I've always been a believer that the most fun come when you use your car, meaning drive it, so good to see there are some people who care more about fun than keeping miles off! I just bought a new-to-me CPO'd 991.1S with 33k on the clock, it had 34k by the time I drove it home. I plan to use it as my daily driver so will definitely be adding some mileage to it. And I tend to keep my cars a long time, I had an 1997 Audi A4 with 164k miles, an 2010 Audi S4 with 106k miles, and heck even my Lotus Elise (which is a difficult car to put a lot of miles on) has 23k now but it's always just been a weekend/fun car. Use them, enjoy them, create memories. Man, there are a ton of garage queens in this thread..... Also some people driving them like they are suppose to. Its a 911 not a GT3 people, get out there and drive them, they wont appreciate. Just did a roundtrip to Monterey and back to the SF Bay Area, which added some miles. Thinking about potentially moving there and commuting to my current job, which would be 180 miles roundtrip per day. Seems a little crazy so not sure yet but testing it out during next week to see how terrible that is. Would definitely increase miles a lot. Side note, I was shocked to see the PCM hit an average trip MPG of 30.5 mpg today during all that highway driving! Impressive. HOLY ****! What model/year/issues? wear and tear on the interior? anything tips to look out for? Interior looks as good as when I bought it, driver seat is a bit worn but it’s to be expected.